Since leaving the White House, this former first daughter has found her own voice. 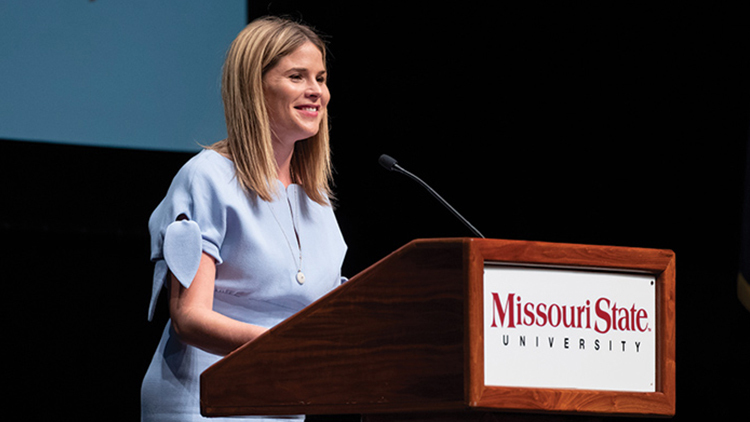 Jenna Bush Hager spoke Sept. 25 at Juanita K. Hammons Hall for the Performing Arts. She is a best-selling author, contributing correspondent for NBC’s Today show, chair of the United Nations Children’s Fund’s Next Generation and editor-at-large of Southern Living magazine . Bush Hager is the author of The New York Times best seller “Ana’s Story: A Journey of Hope.” “Ana’s Story” tells the tale of a 17-year-old single mother with HIV who struggles to shield her child from a life of abuse and neglect. Bush Hager wrote it after traveling to Latin America with UNICEF in 2006. Bush Hager has a bachelor’s degree in English from the University of Texas at Austin. She is the daughter of former U.S. President George W. Bush and First Lady Laura Bush. In 2008, she married Henry Hager. They are parents of two daughters, Margaret Laura “Mila” and Poppy Louise Hager. Thanks to the Missouri State University Foundation, presenting sponsor Northern Trust, and with support form KY3, Bush Hager’s keynote was free and open to the public. The Missouri State University Foundation held a private reception and dinner with Bush Hager.